The Unlikely Homemaker: Starting to get organized again, and one of the cutest pictures ever! Starting to get organized again, and one of the cutest pictures ever! My baby is here! After a scare by my doctor, who told me I had to be induced because my baby was too small (I refused the induction), I gave birth to a healthy baby girl, weighing 8 lbs 2 oz! The biggest out of my 3 kids. At 1 week old, she has almost outgrown her newborn diapers. So far, Baby C is a very calm little one. Unless she's hungry. Then she'll let you know. Now that there are 4 kids 3 and under in my home (my 3 year old niece is here every day M-F), I NEED some kind of order around here! I've been getting up at around 5:30 most days (even before the baby arrived) to tidy up the kitchen and drink some coffee. Other than that, I can't seem to stay focused on any one thing. In searching for great ideas, I've decided to revamp my Homemaking Binder, that I haven't opened in over 6 months. As I filter through the free printable pages online and figure out what might work for me, I'll be sharing with you the great pages and home organization links I come across. 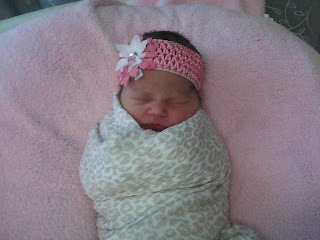 In the meantime, enjoy this picture of the new baby girl that has blessed our home!